THINKING PERSON'S GUIDE TO AUTISM: Have You Seen Flummox and Friends Yet? 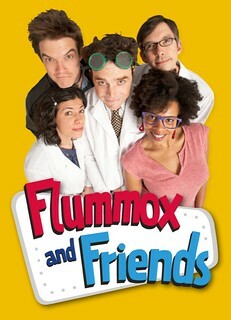 "Flummox and Friends is a live-action comedy for quirky kids about navigating the social and emotional world. We've just released a pilot episode that anyone can watch for free online. The main characters are a trio of inventors and their next door neighbors. We think of it as The Big Bang Theory meets Pee Wee's Playhouse. "The show is targeted at kids aged 6-11, especially those who struggle with the unspoken rules of social interaction. We see it as a show that parents and kids can enjoy watching together and that education professionals can use support their existing social skills curriculum. "Most people are familiar with the 1 in 88 number (autism prevalence in children in the US) and we see the show as for the "3 or 4 or 5 in 88." What I mean by this is that there are lots of kids who struggle -- to greater or lesser extent -- with social and emotional stuff but who don't have a clinical diagnosis, who aren't necessarily part of the special education system and therefore don't have access to those supports. We hope that we've created a show that's accessible to a wide audience that reaches beyond the identified special needs community." Does the pilot episode succeed in reaching its stated goals? Yes and no. Do I think the series can fully succeed, with tweaks and bumps and revisions? Yes, yes I do. Celebrating quirkiness. Professor Flummox and his team of inventors are smart, enthusiastic people who like liking things. Yay for liking liking things -- and for creating three very different, distinct quirky characters, all of whom I liked immediately. I also appreciated that the inventors were the majority, rather than the more typical scenario of a single inventor-type character (e.g., Data or Spock from Star Trek) surrounded by, and spending a disproportionate amount of time trying to understand, non-inventors. Respect. I liked that Dex, the adventurer, had a greeting routine established with every one of the inventors. He was coming into their space, after all. (Person-specific greeting routines are something my own autistic son finds reassuring.) I considered that a gesture of respect and friendship, done on the inventors' terms. Quirky social perspectives. I really appreciated the two animated sequences that talked about coping mechanisms for socializing and dealing with typically sticky social situations like parties -- from the perspective of people who find socializing not just awkward but anxiety-provoking. When the characters from Matt Friedman's Dude I'm an Aspie said that it was okay to choose not go to a party, or to leave if the party was overwhelming -- this chronic party-bolter practically did a fist-pump. Modeling self-respect. In the second animated sequence, one of the kids said it was important to "...have faith, trust, and friendship in yourself." Yes. It is. Thank you. Humor. Down to the last detail, e.g., the door chime featuring the mis-played version of Those Endearing Young Charms from the classic Bugs Bunny cartoon Ballot Box Bunny. Variety. The interspersing of live action, animated sequences, and music videos from Morgan Taylor (of Gustafer Yellowgold) kept me entertained, and my attention span is similar to that of a 6 - 11 year old. Social accommodation can go both ways. Unfortunately the inventor trio ... spent a disproportionate amount of time trying to understand and accommodate the non-inventors. I'd like to see a more balanced approach in which the two types learn to accommodate each other -- for instance pointing out that Suzie Swizzler could had used an "I statement" (do educators still teach those?) instead of having a snit when the inventors didn't "get" her party. Practical advice. I'd also like to see more of the practical exchanges like Professor Flummox's admonition to inventor Wanda not to speak with her mouth open because food particles could contaminate petri dishes etc. That was awesome, funny, and didn't make Wanda feel judged. And in many cases, making the socially appropriate choice will achieve better results, not just make other people feel better. I think it's OK to model this. Choice in social participation. I'd like the characters to be asked if they'd like to learn how to behave in a certain scenario, and let them sometimes say no, and talk through their feelings about why they don't want to (in the spirit of the Dude, I'm an Aspie sequence). The "in the group" musical sequence was funny and illustrative -- but always mandated being in the group, even when Milo balked. Kids don't always want to be in the group, and need support in learning to articulate why, evaluating when it's appropriate and when it's not, and speaking out for their right to refuse. Confidence. I'd like to at least one of the inventors be confident in their approach to social interactions, in the model of Alphas' Gary (diagnosed autistic) and Community's Abed (undiagnosed). I do not watch Big Bang Theory but Sheldon appears to be this way as well. This has again to do with taking a practical approach to learning about social skills -- shift the focus from the character realizing (or being told) what they're doing wrong to the character finding out how to take a more effective approach, perhaps through the observation skills that were emphasized in the pilot. Eye contact. Many autistic people find eye contact difficult, and prefer not to make it as doing so compromises their ability to function in other areas. (A common saying is "I can look at you or I can talk to you, but not both.") This would be a helpful message for Flummox and Friends to spread beyond the autism community. Captioning. One friend of mine found the dialogue hard to follow. Given that auditory processing can be challenging for autistics, it would be lovely if the entire episode was captioned, not just the Everybody in the Pond video. More Autistic Participation I'd like to see Autistics consulting more heavily on the live action scripting. There are just some things -- intuition, experiences, trigger words -- that professionals and parents can't provide when it comes to what works for quirky kids, and what doesn't. I have faith in Flummox and Friends. I believe in Flummox and Friends. Its pilot is not perfect, but that's to be expected -- did you ever see the original, unaired pilot for Buffy the Vampire Slayer? It has The Wrong Willow. But they fixed it, they reworked it, they made it right. My two other favorite series Star Trek: The Next Generation and Star Trek: Deep Space Nine also took a while to find their strides. Many of the elements that made all three series not just fabulous but classics were present from the get-go, but others needed fine-tuning, and still other elements needed to be massaged into shape or stripped out. I want to see Flummox and Friends become the fabulous classic our community has been wanting and needing and waiting for. Have you see Flummox and Friends? What did you think? What can the team do to make it the best show it can be? Disclosure: I was a contributor to the 2011 Flummox and Friends Kickstarter campaign.